To answer this important question, Cass Business School, City University London, studied a number of leading organisations who are active stakeholders in the space of digital transformation. The ‘Roads to Ruin’ report published by Airmic in 2011 looked at high-profile crises of companies which left their reputation in tatters. The ‘Roads to Resilience’ report published by Airmic in 2014 looked at how companies could be helped to avoid corporate catastrophe by learning from those who were leading the way in creating resilient organisations. The report introduced the Airmic Resilience Model. The main objective of the ‘Roads to Revolution’ report is to provide pragmatic advice for risk professionals and board members, executives and other top management. It is aimed at those who want to ensure that risk management, resilience and digital transformation permeate their organisations to constantly protect brand and reputation. It must be stressed that achieving resilience and transformation is challenging and it requires significant board-level support. Walking the “Roads to Revolution” is an existential must. This report highlights the research findings on some of the business and organisational trade-offs that leaders and managers will have to grapple with while walking these revolutionary roads. This report shows the implications of the trade-offs for risk management and governance. This report makes the point that while at face value some definitions and practices for risk management and governance might seem unaffected by the digital revolution, the underlying business and organisational dynamics are so different from the past ones, to trigger the need of a major rewiring of both. For instance, this report shows that boards will have to deal with the digital revolution not just as a cybersecurity issue. Cybersecurity is, and will remain key for any organisation, but boards will have to reskill and introduce new mechanisms to ensure effective and efficient management monitoring, strategic leadership and, ultimately, legitimacy for their organisation. Achieving resilience is challenging and it requires significant board-level support, but achieving and maintaining resilience and successful digital transformation is even more challenging. The research into the impact of digital transformation on the Airmic Resilience Model discovered that additional components are required for the model to take account of digital transformation. Also, enhancement of the existing components of the Airmic Resilience Model is required, so that they became more aligned with advances in technology. The additional components are identified as ‘redesign processes’; ‘retain stakeholders’; and ‘reinvent purpose’. 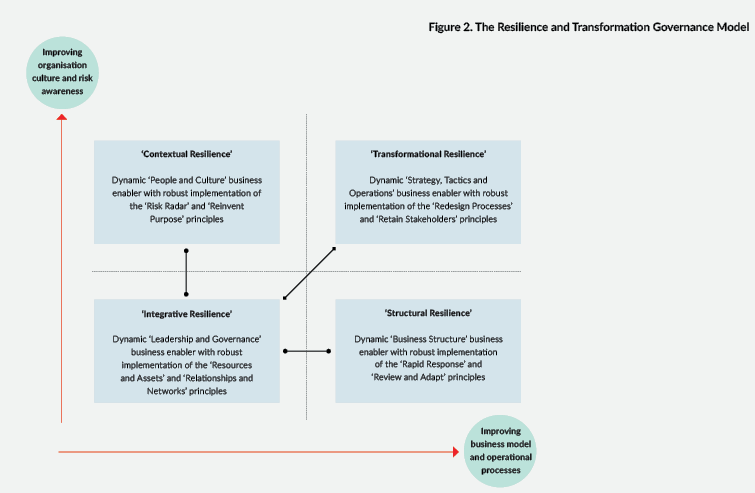 The research has resulted in the development of the Airmic ‘Resilience and Transformation Model.’ The Airmic ‘Resilience and Transformation Model’ at Figure 1 provides a comprehensive and coherent structure to enable organisations to embrace advances in technology. Board members require assurance that the eight principles of resilience and transformation are implemented. However, the board conversation about resilience and digital transformation is most likely to focus on the associated business enablers within the organisation, rather than the principles. The business enablers identified in this report are (1) leadership and governance; (2) business structure; (3) strategy, tactics and operations; and (4) people and culture. The importance of these business enablers is explored further. Organisational structures, the economy and society are evolving very fast. Alongside this, the world of the risk professional has to evolve too. Technology is driving greater connectivity and interdependence at an escalating speed, which in turn means that risk can be more connected and concentrated. Risk that previously might have been considered distinct may develop blurred boundaries. All this is happening in a global context. Companies may have to synchronise risk management activity across several jurisdictions, yet keep it locally relevant and across different operational, tactical and strategic business levels, yet keep it business division relevant. Resilience and transformation can be summarised by considering four types of organisational resilience. Table 1 presents the features of the four types of organisational resilience and these can be used to guide the board conversation on resilience and transformation. 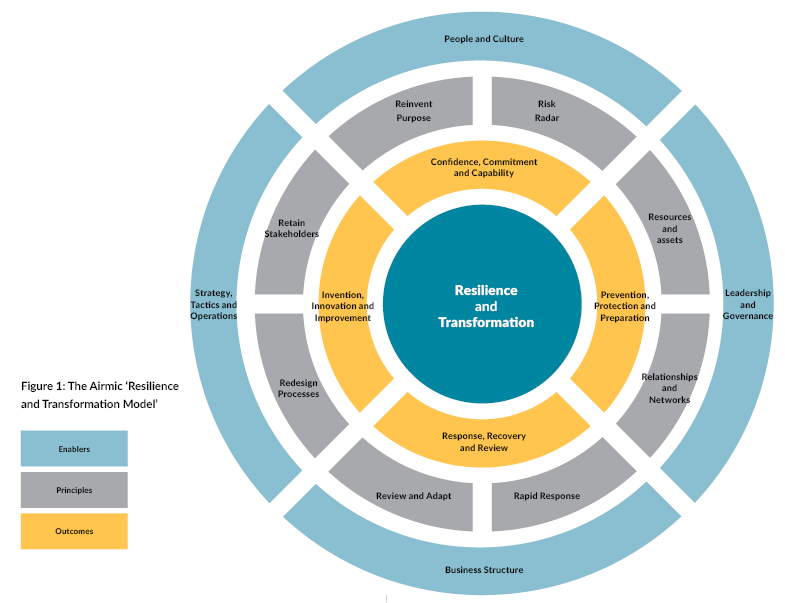 Each type of resilience aligns with robust and dynamic implementation of one of the business enablers at Table 2. All four types of resilience are required for an organisation to achieve successful resilience and digital transformation. None of the styles of resilience is more important than the others, although they do represent an aspiration hierarchy. Arguably, integrative resilience is the starting point for successful resilience. Ultimately, the most successful organisations have strong people and culture business enablers and this represents a position where resilience and transformation results from the confidence, commitment and capability of individuals. Although all four types of resilience are required in order to achieve successful resilience and digital transformation, it is often integrative resilience that is the strongest within an organisation. It is from this point that the three other types of resilience are developed towards structural, transformational and ultimately contextual resilience. This progression represents developing maturity in the resilience agenda of the organisation. Transformational resilience will be enhanced by redesigning processes and retaining stakeholders. In many ways, the ultimate and most difficult to achieve form of resilience is contextual resilience. By developing people and culture and ensuring robust implementation of risk radar and reinvent purpose principles, risk and opportunity awareness will be improved and contextual resilience will be achieved. 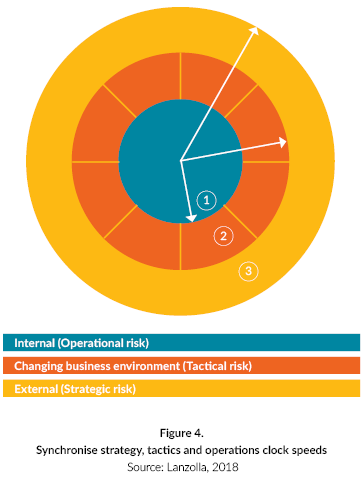 Resilient organisations have exceptional risk radar. Transformational organisations additionally require that the risk radar capabilities are specifically focused on emerging risks. This will require enhanced risk radar with a focus on the developments in technology that offer opportunities for the organisation to enhance their business enablers. Resilient organisations have resources and assets that are flexible and diversified. Transformational organisations additionally require specific focus on the need to strengthen resources where they are insufficient to take full advantage of developments in technology. The additional resources will be designed to ensure that the best advantage is taken of relevant developments in technology. Resilient organisations value and build strong relationships and networks. Transformational organisations additionally examine the need to extend the existing networks. Joint-venture partnerships with organisations previously viewed as competitors is often a means of achieving transformational capabilities. Resilient organisations have the capability to ensure decisive and rapid response. Transformational organisations additionally require that communication barriers within the organisation are removed. The need for greater cooperation and/or elimination of silos within an organisation is required in a way that does not create confusion of roles and responsibilities. Resilient organisations review and adapt to changes and adverse events. Transformational organisations additionally require specific focus on protection and enhancement of the reputation the organisation. This can often result in more successful crisis management which, when successfully achieved, can build the reputation of the organisation by demonstrating the quality of management and governance capabilities within the organisation. Revolutionary organisations can also successfully redesign processes. This requires the successful embracing of new technologies to ensure process improvement. Successful redesign of business processes is based on encouraging innovation, whilst retaining adequate mechanisms to validate decision-making. The requirement for successful implementation of the redesign processes principle is fundamentally based on a forward-looking culture within an organisation. Revolutionary organisations retain stakeholders during the transformation. The ability to retain stakeholders is essential for successful digital transformation. Retaining stakeholders is based on engaging the stakeholders and analysing the big data available about the characteristics of those stakeholders. The key requirement is to discuss and share opinions with all interested parties and develop the options for digital delivery of the identified benefits. Revolutionary organisations have the ability to reinvent purpose. Successful achievement of digital transformation is dependent on a willingness of the organisation to reinvent its purpose. Reinventing purpose is based on opportunity awareness, the active commitment of stakeholders and the availability of necessary capabilities. Confidence in the purpose of the organisation is required to ensure constant evolution. There is a strong link between the ability to reinvent purpose and the risk radar of the organisation. 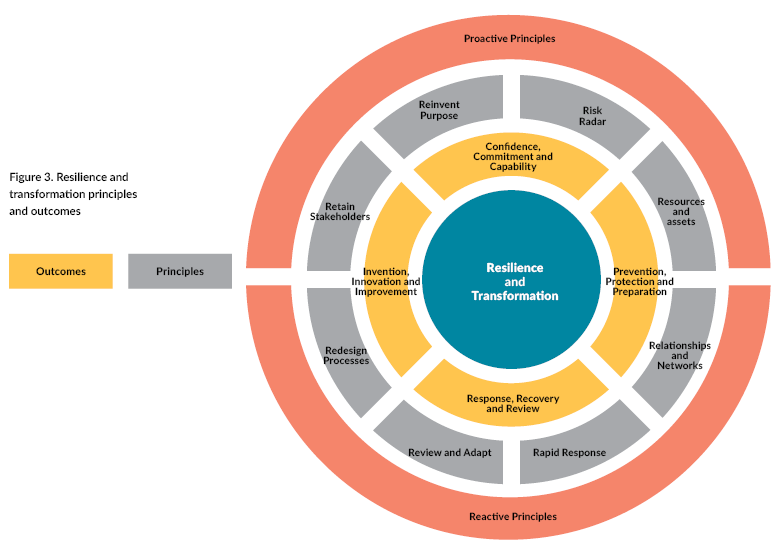 The components of each resilience principle identified by the ‘Roads to Resilience’ research is described in that report. This research identifies the need to extend the five resilience principles to include digital transformation. A range of resilience and transformation practices that extend the existing principles was identified by the research. One example under each of the existing resilience principles is provided below. The risk radar principle has been extended by the inclusion of the additional component ‘Emerging Risks’. The resources and assets principle has been extended by the inclusion of the additional component ‘Strengthen Resources’ in response to identified opportunities. The relationships and networks principle has been extended by the inclusion of the additional component ‘Extend Networks’. The rapid response principle has been extended by the inclusion of the additional component ‘Remove Barriers’. The review and adapt principle has been extended by the inclusion of the additional component ‘Enhance Reputation’. All organisations have these business enablers in place, but the different nature of the enablers in each organisation indicates why there are different roads to resilience and transformation. Every organisation has the capability to achieve increased resilience and digital transformation, but it requires risk professionals and boards to decide how each of the enablers can be managed, to change the way an organisation views risk management and the achievement of increased resilience and successful transformation. Risk teams need to demonstrate strong business or commercial acumen and engage more intensely with the company’s strategic ambitions and major investments. This will sharpen their ability to develop valuable insights into emerging concerns and help scope innovative risk mitigation solutions. Revised analytical methodologies, including the introduction of new data science and automation techniques, should free up capacity in risk teams for more project-based (as opposed to routine) risk work and the provision of advice to business and functional leaders. A more creative lens with regard to emerging risks will enable risk teams to engage with institutional and individual biases and blind spots and help build an appreciation of threats for which evidence may be limited or conflicting. Strategic, tactical and operational technology risks must be synchronised to avoid the creation of lags. Risk management must synchronize the different speeds at which the strategic (or external) risk, tactical risk and internal (or operational) risk run. The job of the risk professional is to challenge the organisation to make sure that lags do not emerge and that all the “clocks” illustrated at Figure 4 are synchronised, move smoothly and in the same direction. “This report provides some clear signposts for the new knowledge and skills our members must have. The future is now and risk and insurance professionals and their professional acumen must reflect this”.